Toitures PME specializes in residential, commercial and industrial roofing and has a well-deserved reputation in this sector. The growth our company has achieved is testimony to our standing as roofing experts. We inspire confidence in our clients by consistently ensuring quality products and workmanship, professionalism and timely installations. Not to mention our courteous employees, a team of multi-skilled, experienced roofers, and leading-edge equipment. Over the past several years, an increasingly wide array of products and options has appeared on the market. A building’s appearance is of the utmost importance, on a par with its geographic location, the roof slope, budget and performance expectations. Only professional roofers can provide you with expert advice and guarantee roofing installation that meets all your needs. When you choose Toitures PME, you benefit from a crack team of trusted, hard-working professionals. 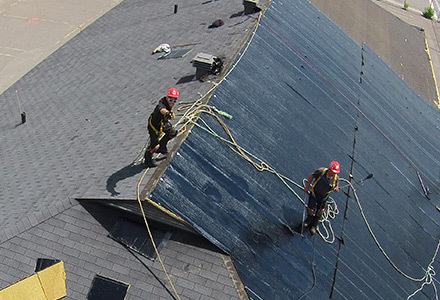 We provide 24/7 roofing service and are also highly committed to ongoing research and innovation. Our service department is entirely devoted to analyzing roofing problems and developing strategies to maximize the lifespan of your roof and the quality of the installation. Our roofers believe each client and building is unique. Whether you need to replace the roof of a cabin or a commercial building, we take the time to gain a full understanding of your needs and suggest a roofing material that provides the best quality for the money. We are experienced roofing specialist with all the necessary skills. Do not endanger your life; falls from great heights are one of the major causes of accident registered with the CSST. Experience makes the difference.